You know I’m excited about something when I wake up naturally before my alarm goes off in the morning, and leap out of bed ready to greet the new day! 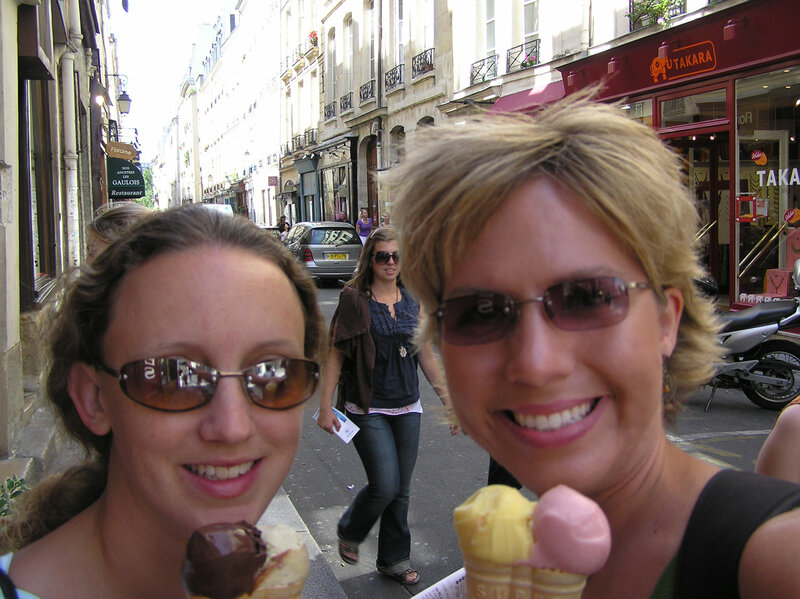 Well, on this day of my 2007 summer in Europe, I was excited about the fact that I WAS IN PARIS! The city I had dreamed of visiting for so long. I couldn’t stay in bed any longer, even after a late night out the evening before. I quickly got myself ready then headed out to find some breakfast while my travel buddy, Teresa, continued to get ready. I walked down the street to a boulangerie (might have been a pâtisserie – don’t they both sell pastries?) and bought us each a croissant and a pain au chocolat. Anyway, after enjoying our scrumptious breakfast, we headed to the grocery store to pick up some random things, dropped them off at our apartment, and headed out again to explore! 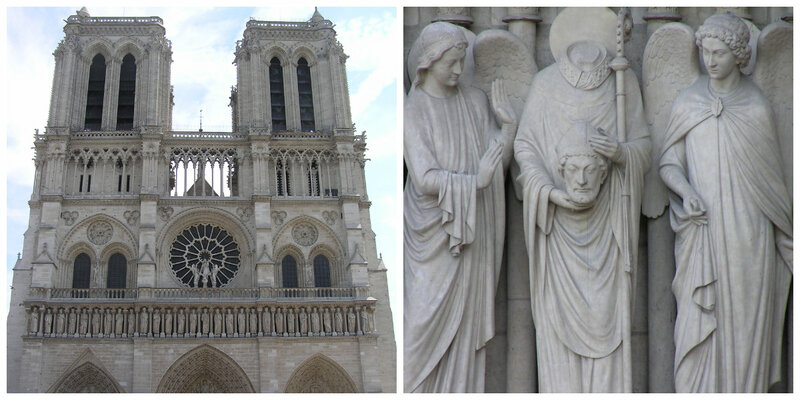 We took the Metro to the Île de la Cité, the center of Paris and home to the famous Cathedral of Notre Dame. The Île de la Cité is actually the larger of two natural islands on the Seine river. Entrance to the Cathedral of Notre Dame is free, and as we waited in line to enter, we admired the detailed architecture, carvings, and statues on the outside of the building. This cathedral is massive! And the stained glass windows inside are the most impressive I had seen yet during my ten weeks traveling through Europe! Absolutely stunning! We walked through the cathedral trying to take in as much as possible. One thing I wish I had done during this trip to Europe, and something I wish I did more often while traveling or even while living, is to take my time. Don’t rush. Take time to really see. To really hear. To really be. Breathe in the beauty of an alpine meadow; absorb the solemnness of a cavernous cathedral; memorize the detailed brushstrokes of a famous painting. Instead, it seems like a lot of times I’m just moving from one place to another, trying to cram in as much as possible into one day. And I know this happens because there is just so much to see and do in this world that fifty lifetimes couldn’t cover it all! And I really do want to see and do as much as I can! But sometimes, it’s nice to just stop. Really take in my surroundings. Then once I’m filled with them, so that they’re imprinted on my mind and heart in permanent ink, I can move on. 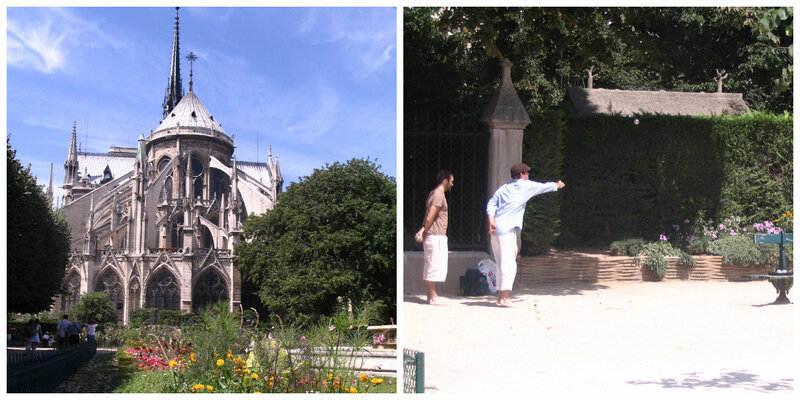 We exited the cathedral and walked around to the back where there are some gardens and men playing boules. We then crossed the street and visited the Deportation Memorial which remembers the 200,000 French people who were deported from Vichy, France to Nazi concentration camps during WWII. Very sobering. Leaving there, we crossed a bridge to the smaller island on the Seine, Île Saint-Louis. Now if I were to ever have the opportunity to call Paris home, this is where I would want to live! Most of the island is residential but there are quite a few restaurants, shops, and cafes to enjoy. It is so peaceful here and I loved the narrow streets and uniquely Parisian architecture. After a quick stroll along the Seine, a visit to Shakespeare and Company (loved! ), and a walk through the Latin Quarter, we decided it was time to tackle the Louvre. We had visited many museums on this trip, but none of them compared to the Louvre! It is beyond enormous! We only visited a few floors of one wing, but what we saw was incredible! We entered through the glass pyramid, picked up museum guides, and headed to the Denon Wing. We wandered through displays of ancient Greek and Roman artifacts, French and Italian paintings, and of course, saw the Mona Lisa. While the Eiffel Tower was so much larger than I thought it was going to be, the Mona Lisa was much smaller than I was expecting. There were, of course, hordes of people in the room that contained this masterpiece, but we still managed to get close enough to take some pictures. And this was one of those rare moments when I actually took some time to just stand and stare, taking in the fact that I was looking at quite possibly the most famous painting in the world. At this point, it had been hours since our lovely French breakfast and we were both starving. We weren’t ready to leave the museum yet so we checked out the on-property dining options. 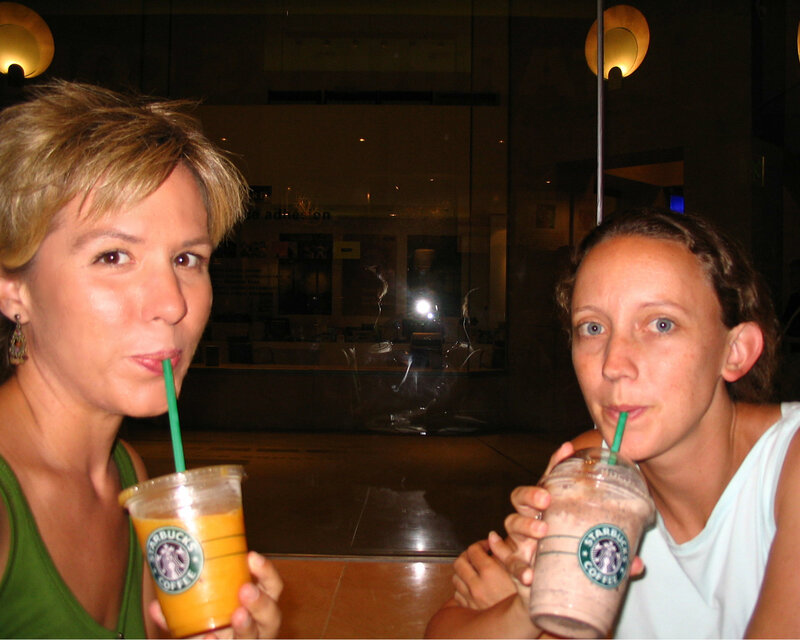 And settled on Starbucks. 🙂 Frappuccinos and a veggie wrap were just what we needed to re-energize ourselves! We decided we wanted to see something different and searched out the well-hidden and extremely-hard-to-find Arts of Africa, Asia, Oceania and the Americas. This was a nice change from most of the art and artifacts we had seen and we were glad we visited. 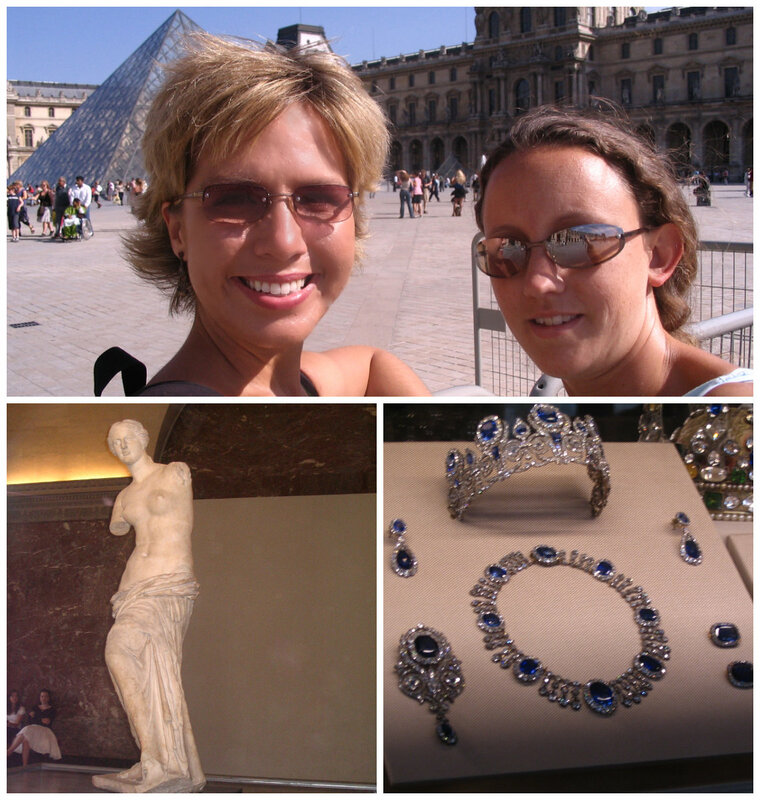 After this, we said good-bye to the Louvre and headed back to our apartment where we enjoyed salads and fruit for dinner while watching one of our favorite movies, French Kiss. 🙂 A quite lovely first day in Paris! During our first full day in Paris, we went to the Visitor Centre and each purchased a 4-Day Paris Museum Pass. This pass provides entrance to many of the city’s museums as well as other attractions and monuments. It was a real money saver for us and I highly recommend it! Not only can it save you money over purchasing individual tickets, it saves time at those places where lines at the ticket windows can be quite long (Versailles, anyone?). It is available as a 2, 4 or 6 day pass. Entrance to the Cathedral of Notre Dame is free, but if you want to visit the cathedral Tower or Treasury, there is a fee. Entrance to both is included with the Paris Museum Pass. 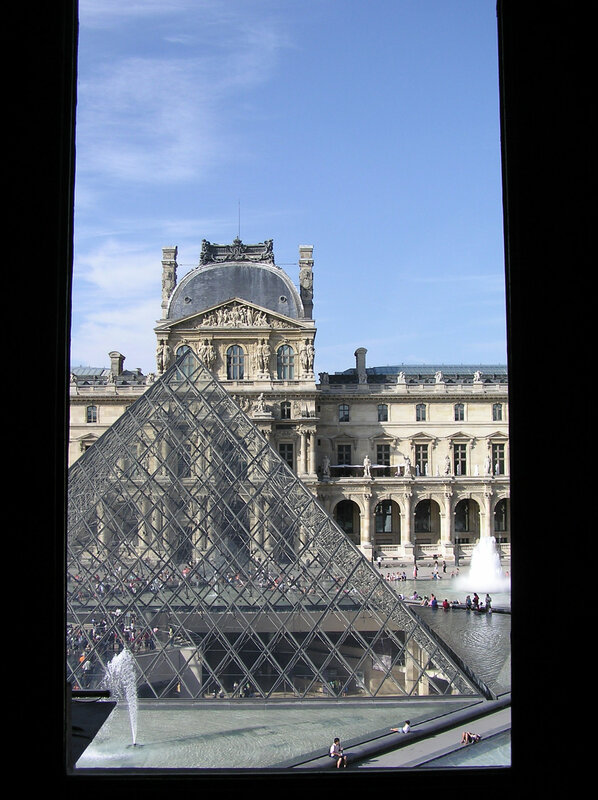 The Louvre is one of the world’s largest museums – so don’t expect to see even a fraction of it if you visit! It can be quite overwhelming so I suggest obtaining a museum guide prior to your visit and mapping out in advance the exhibits you would like to see. 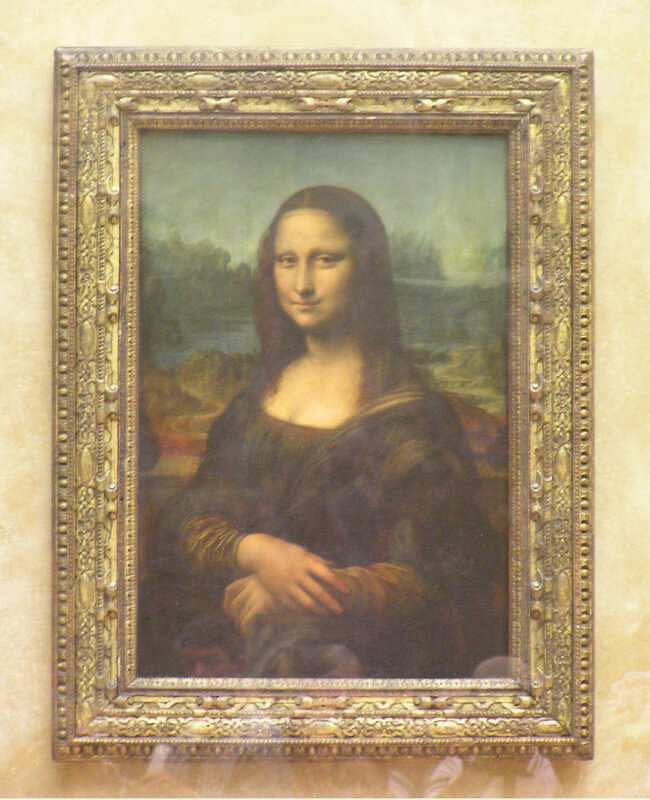 Of course, the Mona Lisa is the most popular, so it’s probably best to head there first so you’re sure to see it.